Stroll down New Orleans' famous Bourbon Street with your camera, and you can easily get overwhelmed. 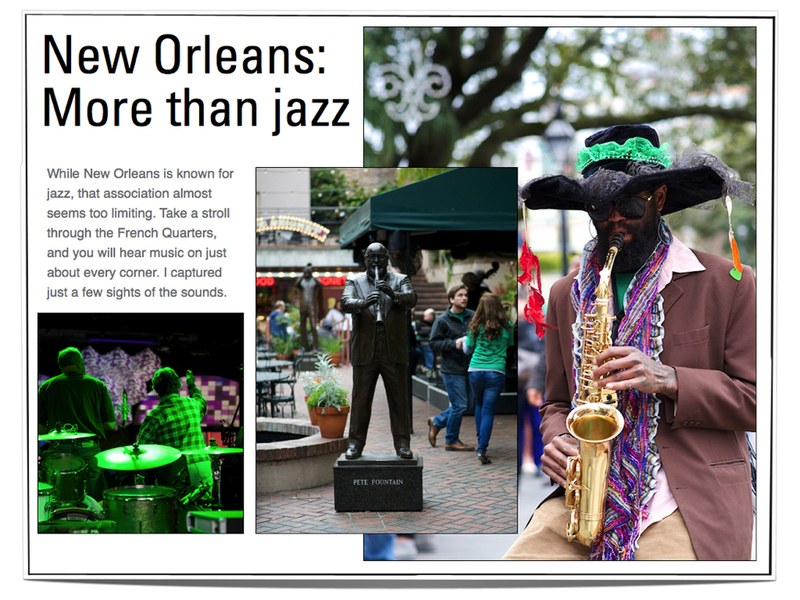 The Big Easy, like many travel photography locations, boasts so many great photo ops, you might have a hard time deciding what to photograph first. Or next. Don't be tempted by the lure of every interesting photo idea, however. That's the sure path to a gallery of generic tourist snapshots. The best travel photographers don't just chase pictures, they look for great stories. That's what makes their work stand out. Just ask National Geographic's David Griffin. In his TED Talk, he says that most photographers can capture one or two great shots at any location. "But to be a great photojournalist, you have to have more than just one or two great photographs in you. You've got to be able to make them all the time. But even more importantly, you need to know how to create a visual narrative. You need to know how to tell a story," says Griffin. What are the story elements? - Who are the characters? What is the setting? Where is the emotion? Can you find conflict? Any universal human themes unfolding? Find your hero - Who or what is the story really about? Sometimes it can be a person. Other times, you can create a theme. Just like every photo needs a strong focal point, your travel photography will need a strong hero, or big idea, as well. Tell the story - How will your story unfold? Will you tell it in chronological order? Geographic? Flat Stanley approach? Remember for maximum impact, try to capture your photos at the height of the action or emotion. Don't forget the details - Details are the hallmarks of a great story, as well as one of the key ingredients in great travel photos. Fill the frame with small details that help illustrate your story. This is a good time to look for texture, mood, colors, shapes or other distinguishing characteristics. Envision the final product - Sometimes it's helpful to think about the final format as you begin creating. If you are shooting to create a coffee table book, for instance, you might think about what your cover shot should look like. Will you create your photo book in a horizontal or portrait orientation? That influences the way you shoot. Is there one image that can capture the essence of the story at a glance? If you are shooting for a blog, you might think about the order in which you will show the images. Do you have all the photos you need to move the story along? How will you transition from one idea to the next. Look for photos that help advance your story. In the picturesque scenes around the world, it will be tempting to snap photos of everything that moves you. If you are looking for a more seasoned travel photography approach, let some good photo ops go by in search of great storytelling opportunities. See more great New Orleans photos on my Pinterest board or take your own on our PhotoTour New Orleans.